with as the Russian army was approaching his underground bunker in Berlin. The world had not become aware of the Holocaust. 50 million people were still alive. I am quite certain that with the distance of 70 years and our knowledge how it all ended with Hitler we see the film with different eyes. 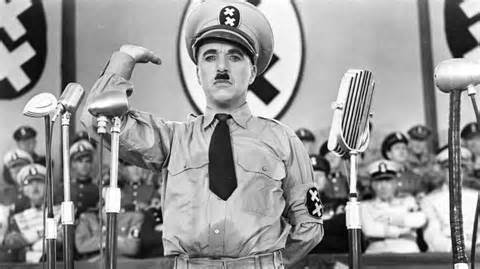 Charlie Chaplin wrote, directed, and starred this satire about Hitler. The humor still works today. Parts of the film are brilliant. Apparently audiences in 1940 were turned off by the moralizing ending. I did not feel the same way in light of the crimes that Hitler had committed by 1945. Every fan of movies should see this first film. Chaplin only made silent films until this one. Chaplin does a great job in talking like Hitler, maxing nonsense German and English words. This entry has been viewed 344 times.